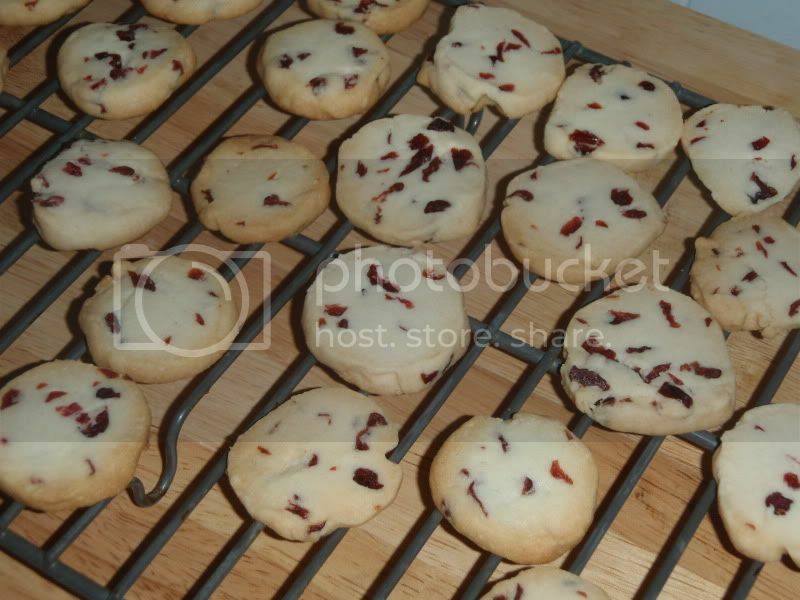 This recipe appeared in a 2010 Martha Stewart holiday cookie magazine entitled "Cranberry Coins." I had a little trouble with the cooking time, so the following reflects what worked for me. Shortbread is often temperamental, but the buttery result is well worth it. In the future, I may try this recipe with dried cherries and possibly add nuts. If you hop on over to my crafts blog, you'll see how I packaged them for distribution. 1. Using a mixer, cream together sugar, butter, and vanilla until smooth. Stir in flour and salt. Work in cranberries until evenly distributed. 2. Divide into 4 portions and roll into logs (1.5" diameter) and wrap in parchment paper. Chill for 30 minutes. The recipe provides that you can chill up to a day or freeze for up to a month, but dough that is too firm is as difficult to work with as dough that is not firm enough. Prepare to make adjustments if you leave dough in the fridge for more than 45 minutes. 4. Using a sharp knife, cut into 1/4" discs. Bake on parchment paper for 15 minutes, then rotate and bake for 10 more minutes until edges turn golden brown. Depending upon your oven, it may be necessary to begin with 20 minutes of total cooking time. 5. Allow to cool completely on wire racks.